211 Bernard: Graphic Novel Book Club: The Greatest of Marlys! Graphic Novel Book Club: The Greatest of Marlys! Each month we host a Graphic Novel Book Club meeting, open to all, during which we hang out and informally discuss a featured graphic novel. 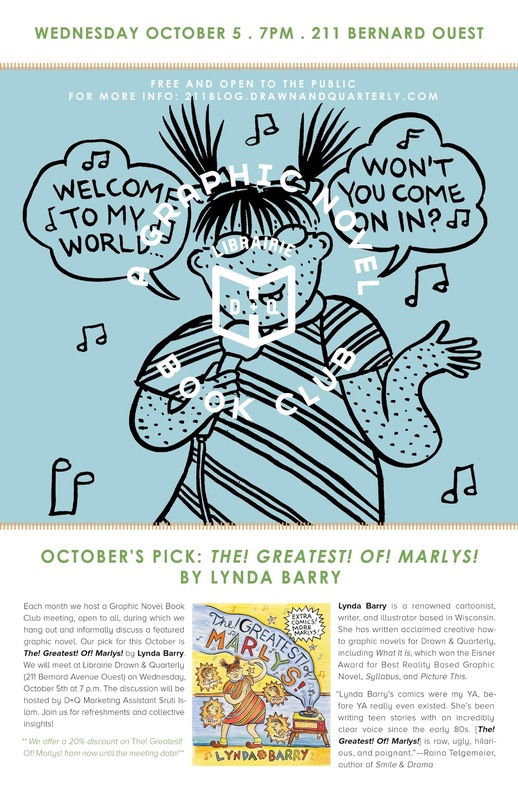 Our pick for October is Lynda Barry’s The Greatest of Marlys! We will meet at Librairie Drawn & Quarterly (211 Bernard O) on Wednesday, October 5th at 7:00 p.m. The discussion will be hosted by D+Q marketing assistant Sruti Islam. Join us for refreshments and collective insights! **We offer a 20% discount on The Greatest of Marlys! from now until the meeting date. Lynda Barry is an acclaimed cartoonist, writer, and illustrator based in Wisconsin, where she is assistant professor of art and Discovery Fellow at University of Wisconsin-Madison. She has written two bestselling and acclaimed creative how-to graphic novels for Drawn & Quarterly, What It Is, which won the Eisner Award for Best Reality Based Graphic Novel, and Picture This.